Explore Mario’s world in 3D with Super Mario Odyssey for Nintendo Switch! Embark on a journey through huge kingdoms old and new, from the familiar Mushroom Kingdom to the skyscraper-packed New Donk City. With breath-taking new locales and exciting new abilities, Super Mario Odyssey for Nintendo Switch has Mario travel between worlds on the Odyssey airship to rescue Princess Peach from Bowser's nefarious wedding plans. 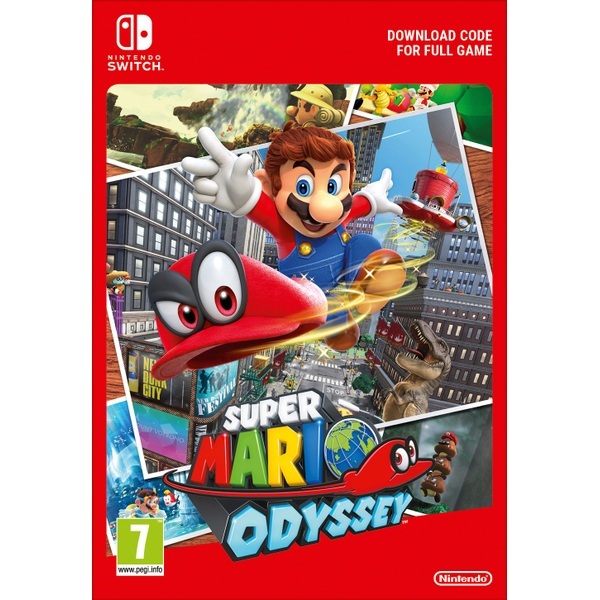 This sandbox-style Mario adventure allows the gamer to roam Mario’s world at will, uncovering new mysteries as you explore the vast and varied world of Super Mario Odyssey for Nintendo Switch. Use Mario’s incredible new abilities to collect the Power Moons that power the Odyssey. With the help of his new friend, Cappy, Mario has discovered all-new moves for his globe-trotting adventure. This mysterious character from the Cap Kingdom has morphed into Mario’s cap. Now Mario can use cap jump to leap higher, cap throw to take out enemies and capture to take control of objcts and enemies alike. Take on Goombas, Chain Chomps, taxis and even a T-Rex! Discover hidden secrets and surprises in the huge 3D kingdoms you explore on your quest to rescue Princess Peach. Find new costumes for Mario, cruise around the diverse worlds in vehicles that incorporate the HD rumble feature of the Joy-Con controller, or explore sections as Pixel Mario. This is the first sandbox-style Mario adventure since 1996's iconic Super Mario 64 and 2002's Nintendo GameCube classic Super Mario Sunshine. Explore incredible worlds as you join Mario and his new ally Cappy on a massive 3D adventure in Super Mario Odyssey for Nintendo Switch.